Completely furnished turn key apartment completely remodeled from front to back, just bring your clothes. Heated pool, four gas BBQ grills, shuffleboard and complete laundry facilities. 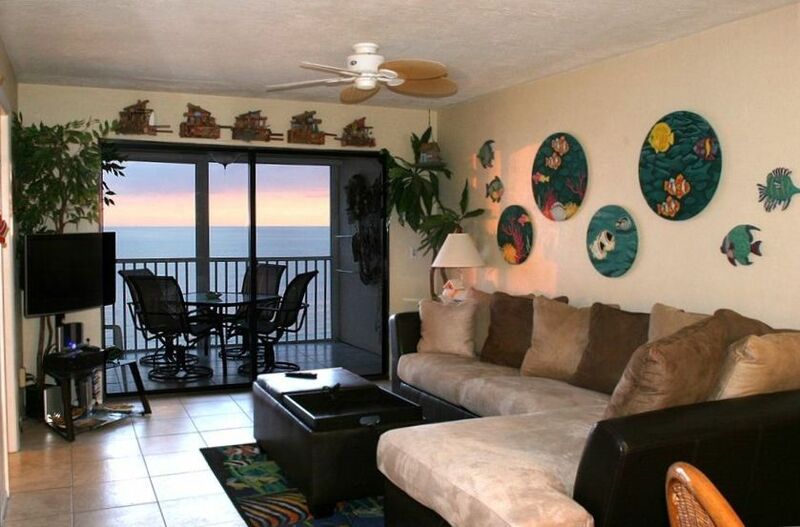 The condo includes three ceiling fans, central Air Conditioning, screened patio right on the Gulf, walk-in master closet, three NEW Digital LCD TV's (NEW 50in. HD TV in the living room), 2 DVD's plus BLUERAY with Netflix, Stereo/CD IPOD system, VIDEO Game system with 70 games, Cordless phone, all linens, and a fully-equipped newly remodled kitchen with Granite Counters. Bring your K Cups because I just added a Keurig Coffee maker, There is a 12 cup drip maker as well and grinder for your beans. I have been a member of VRBO for 18 years and I encourage you to look at some of my previous renter's reviews. I can't guarantee you perfect weather, but I do promise that my condo is everything it appears to be and then some. This is my second home and I believe it is furnished and equipped to make your vacation everything you would expect. I purchased this condo in 1997 when I lived in Ft Lauderdale. It was an hour and a half away and we would spend weekends on the beach. I currently reside in Panama, so when I am not soaking up the sun myself, I offer my Luxury condo for rent on a weekly basis. The condo is located mid island, 2 miles South of the Times Square area, 2 blocks to the Publix Supermarket. The perfect mix of convenience without the noise and traffic of the Times Square area. I love that I can hear and see the Gulf from almost everywhere in the condo. Laying in bed, listening to the ocean affords me the most restful sleep whenever I am staying there. There is nothing that I enjoy more than sitting on the Lanai, glass of wine in hand watching the amazing sunsets over the Gulf. I know you will too. toilet, shower, Walk in Shower, Granite counters with Vessel sink. Newly remodeled bathrooms, fully tiled floor to ceiling. Hair Dryers in both bathrooms. FREE high speed wireless internet. Blueray Player with NETFLIX Connectivity. Works with your Netflix account. L shaped sofa chaise with queen sleeper. A great place to nap. Variety of books and magazines. 3 miles, just off the island is Capt Tony's Fishing Express. I've fished with them for years. Great boat, crews and a fun day.....and I always bring home fish for the grill. Love Boat ice cream is 10 minutes away, just off the island. If you like ice cream, you will LOVE Love Boat.